Corando Ocean Club is an ocean lover’s dream, located right between the Intracoastal Waterway and Atlantic Ocean in Highland Beach, Florida. These waterfront Highland Beach condos offer luxurious living just steps away from the white sandy Florida beaches that stretch for miles down the coast. Choose from 4 different floor plans that make up 336 two bedroom condos divided into two separate buildings. No matter which building you choose you’ll always have a marvelous view of the water as each building faces either the Intracoastal or the Atlantic Ocean. Corando Ocean Club condos are top-notch with their elegant upgrades. Each residence features large open floor plans, granite countertops, marble or wood flooring, chef’s kitchens, walk-in closets, crown molding, and spacious outdoor balconies perfect for taking in the glorious views of Highland Beach. New residents will be amazed by the luxurious amenities offered by the condo community. The Corando Ocean Club has its own beach club with private beach access, well-designed swimming pool, sundeck with lounge area, picnic area for gatherings, putting green, fitness center, game room, and so much more! 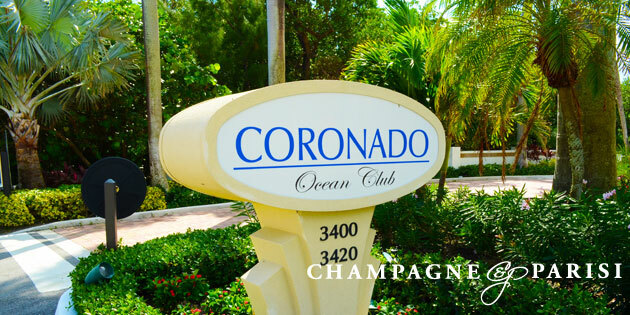 Corando Ocean Club also has a social calendar filled with events for year round fun! Both buildings have 24 hour manned security, and full concierge ready to help a resident at a moment’s notice.